The Ian Potter Museum of Art at the University of Melbourne will be the first Victorian gallery to host Max and Olive: The photographic life of Olive Cotton and Max Dupain. The touring exhibition, from the National Gallery of Australia, brings together a substantial group of works by these famed Australian photographers for the first time. 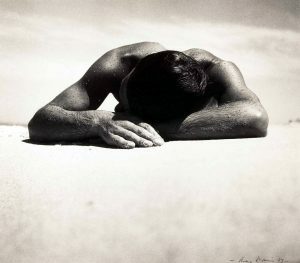 The exhibition features 65 selected works from the NGA’s sizable collection of rare vintage prints by Dupain and Cotton made between 1934 and 1945, including some of Australian photography’s best known images, such as Dupain’s Sunbaker (1937) and Cotton’s Teacup ballet (1935). Australian culture. Friends from childhood, Dupain and Cotton produced now iconic photographs during an exciting period of experimentation and growth in Australian photography. Their professional relationship spilled over into their personal lives and the two were married for a short while from 1939. Max and Olive explores their shared lives, studio and professional practice. Keenly aware of international developments in photography, Cotton and Dupain experimented with the forms and strategies of modernist photography, and drew upon the sophisticated lighting and compositions of contemporary advertising and Hollywood glamour photography. They brought to these influences their own, close association with the rich context of Australian life and culture during the 1930s and ’40s. Their achievement was the development of a truly modern Australian photography that reflected their own, very particular relationships to the world and to each other. The National Gallery of Australia acknowledges the generous support of the National Collecting Institutions Touring and Outreach program; Visions of Australia; and Media Partner ABC Local Radio.